Here’s Kimba’s late bunny mate, Mr Bunsy. 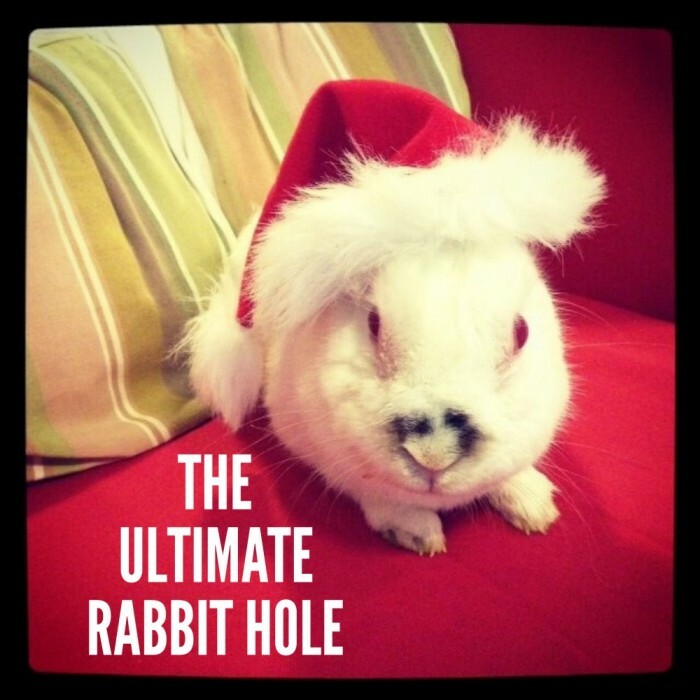 Me thinks this Santa-esque snap will have everybunny feeling festive, don’t you? Now, tell me if you could describe your week in one word, what would it be? Mine would be “whirlwind”! It seemed no sooner than it was Monday that it was Saturday again! But that’s nothing to complain about because I just fast forwarded my way to the weekend and some quality reading time down the rabbit hole. Let’s hop to it, shall we? First things first, thanks to everyone who entered the Grand Festive Giveaway – you can check out who won what here. Today is National Sacher Torte Day but this cake is as complicated as it is delicious and ain’t nobody got time for that! Yesterday was National Cookie Day and I always have time for cookies, don’t you? If you’re a cookie monster like me, you will need to check out these 26 Insanely Delicious Cookies You Won’t Be Able To Resist. Talking of special food days, how about 31 of them? December is National Cookie Cutter Month and I am very excited about it. I collect cookie cutters, did you know? And my ambition in life is to have a collection rival Nigella, because she collects them too! I don’t get to use my cookie cutters as often as I’d like so I’m keen to try out these Neat Things You Can Make With Cookie Cutters, and believe it or not, not one of them’s a cookie! Christmas is coming and I am very excited about it. If you’re looking for some top tips, clever tricks and delicious recipes for the festive season then you need to download this FREE Christmas Survival Guide and not just because you can find my best ever fudge recipe inside! Don’t delay, download it today! I love me a good hack, and these Christmas ones are just cracking! You’ll be reading it and thinking why didn’t I think of that? If you’re after some wreath action and your fingers aren’t green, you should totally check out this DIY Christmas Light Wreath, it’s so easy, I think even I could do it! For more wreathy good ideas, check out this showcase of Christmas loveliness. Talking of Christmas loveliness, how cute (not to mention delicious) is this Chocolate Nativity Scene complete with jelly baby Mary and Joseph! Best! Christmas is the season of yum, that’s for sure. I don’t want to spend most of 2016 working off the calories I consumed at Christmas 2015, and for that reason, I’m loving these 12 Ways to Have a Healthy Festive Season. While we’re on the subject of being healthy and taking care of yourself check out the low tox products that Shannon is loving. I’m still in love with my Jamberry nail wraps which are five free, gluten free and even vegan! Oh and they make awesome Christmas presents. Just sayin’! I don’t know whether it’s because I’m getting older or more cynical (or both,) but Christmas seems to be getting more commercialised every year. Often, the simplest gifts are the most meaningful and here are eight great ideas to get you started. And remember while you’re taking a ride on the Giving Train don’t forget to give something back to yourself. Here are 11 gifts to give from you to you. And one last thing before I go, how cute is this Kit Kat Christmas Forest? Have you got a good Christmas hack? Is it me, or do you think Christmas is commercialised too? Will you have a wreath on your door? Have you got a low tox product that you love? Whatever you’re up to this weekend, hope it makes you happy!